Vietnam Veteran. Rosebud Sioux Tribe elder. Hippy communist. Senior adjunct professor: Dan Kennan is a man of many titles, pasts and talents. But throughout his life one thing has remained constant—his passion for activism. “I’ve been arrested 14 times,” Dan smirks with wry humor, adding, “Three times in one weekend by the same officer, but that was back in my hippy communist days.” Thirteen arrests happened in 1970 and one in 1971, but all happened at marches. Ten times were during anti-war protests and four for civil rights, the two topics he is most passionate about. Dan attended his first civil rights march when he was just 13 years old. “An old fat white guy came up and just called me every name in the books, and I will never forget the hatred and the vile in his face. It just stunned me. I thought, ‘We’ve got some work to do here,’” Dan says. 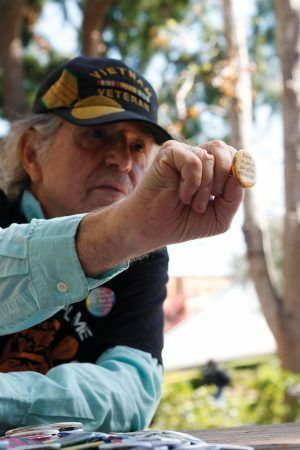 At this interview, he wears a button reading, “Stay Woke” pinned to a Martin Luther King Jr. shirt, which he pairs with a Vietnam Veteran hat. His piercing blue eyes are framed by his long gray hair, which is pulled back into a ponytail. Some students have commented that he resembles Willie Nelson. Dan easily cites numbers pertinent to his life. “Those type of things get burned into your mind,” he says matter of fact. He was born in La Verne when there were only 2,300 people in town. After attending Bonita High School, he naturally started at the University of La Verne just two days after he turned 17. He took a break from attending ULV for a few years, and during that time he was drafted to Vietnam, June 19, 1968. 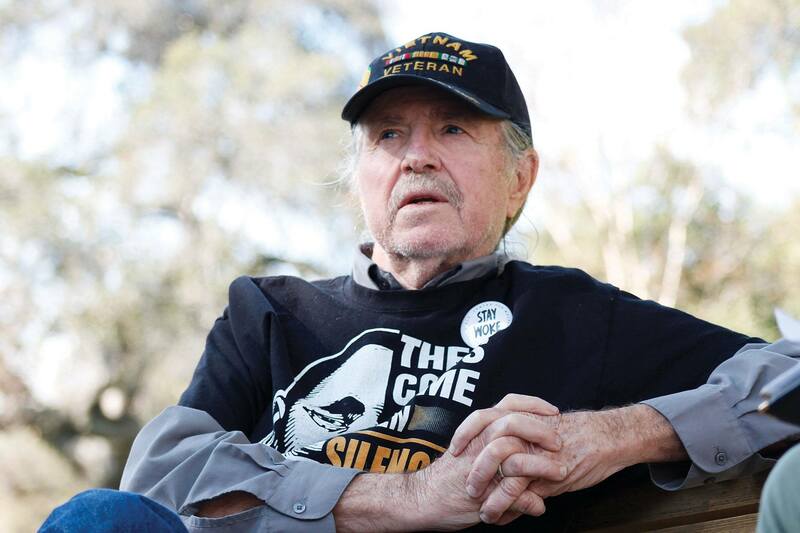 “When I got out of the service, I walked into my parent’s house two minutes after midnight on Jan. 23, 1970, and at 4 o’clock that afternoon I was at an anti war rally on Indian Hill and Arrow.” He was in Vietnam for 14 months and 13 days. Although Dan had already protested the war before he was drafted, when it came down to it, he knew that the Vietnam War would be a defining part of his generation. He felt he needed to see it and personalize it, not just talk about it. He also did not want to serve the five-year prison sentence for draft dodging. “It sounds kind of funny, but I’m glad I went. If for no other reason, it gave me a real, real, real clear direction for the rest of my life,” Dan says looking at the more than 50 pins laying in front of him on the table. Some read ‘Jesus was a liberal,’ and ‘You can’t take my rights, I’m still using them.’ He has two more boxes of pins full of witty, political and progressive messages at home. He has accumulated the pins from the hundreds of marches he has attended. When Dan came home from Vietnam, he started to work in the field of juvenile delinquency. He started in a residential home where children go who have encountered problems with the law. “My job was to try to teach them not to be knuckle heads,” Dan says. He soon decided it was time to head back to the University of La Verne to gain his degree. “I wanted to do it right. I had done it wrong the first time, so it was my own pride. But I firmly believe we learn what we want to learn. The first time around, I wanted to stay eligible to play ball; the second time, I was there for the right reasons.” At Bonita High and at ULV, he played baseball, basketball and football. His mother and father were “informal” counselors for people with substance abuse and alcohol problems, and Dan remembers being fascinated by their work. When he was seeking career direction, he was offered a juvenile delinquency job. “I don’t believe in coincidences; I believe that is what was meant to happen. So I started working, and I literally fell in love the first day. I never fell out of love.” He obtained his sociology degree in 1976, 11 years after his first day at ULV. After taking a year off, he continued on to earn in 1979 his master’s degree in Public Administration from Pepperdine University. Dan has also been a tribe elder for the Rosebud Sioux Tribe for 18 years. His grandmother was half Sioux and introduced him to the culture and traditions. His Native American Sioux heritage is now up front for him, more than it was when he was a teenager. He says he eventually realized there was something missing in his life. “I was studying all kinds of philosophies and religions, but nothing seemed to work. So I thought, ‘Why not go back and do what worked when you were a kid?’ And it does.” Some of the components of becoming and being a tribe elder include learning, teaching and participating in many ceremonies. “The philosophy is that 24 hours a day we are all students, and we are all teachers at the same time. Whatever wisdom I have, I need to share with others.” He serves as an elder by sharing his knowledge, attending ceremonies and participating in everything he can. While most ceremonies are local, every summer he travels to Sundance on the Rosebud Reservation in South Dakota. People from all 50 states and nearly 15 foreign countries attend the event. “It is the Super Bowl of ceremonies,” Dan chuckles. With 20 years of experience working in a juvenile detention center, the title of a tribe elder and as an activist with hundreds of marches under his belt, Dan brings his personal experience and passion for bringing change to the classroom. 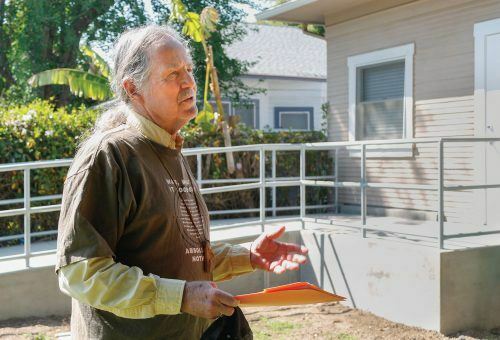 “If I had to pick a place to teach, it would be La Verne,” Dan says. “The big thing for me is seeing the wisdom light go on.” He says he sees himself in many of his students, initially not in college for the right reason, but when someone gets through to them, they recognize the value of getting an education, not just a degree. His desire to teach at La Verne worked out. He approached Dr. Sharon Davis, at the time the chair of the sociology and anthropology department, with the idea for a class about the 1960s. He says he gathered all of the material and information he had about the time period together, and after realizing he had 6,000 pages of material, he whittled it down as much as he could and wrote the book himself: “The ‘60s.” The class focused on civil rights, the Vietnam War, protests and music—the four things people remember the ‘60s for the most, Dan says. He now also teaches juvenile delinquency, Native American studies and social justice at La Verne. Sharon, Dan’s significant other of 19 years, first met him when she was looking for a guest speaker for her juvenile delinquency class. She called the Boys Republic, a non-profit treatment facility for “troubled youngsters,” and the woman who answered the phone recommended Dan as guest speaker since he was also an alumnus of La Verne. Dan spoke in Sharon’s class year after year; then, their professional relationship eventually turned into something more in the late 1990s. The two travel together often and are planning a January trip to Vietnam. They have visited places of significant historical change like the site of the St. Valentine’s Day massacre in Ireland and Nelson Mandela’s home. “He just stood there and cried,” Sharon says, recalling their trips. “He is one of the kindest and most compassionate people I have ever met. He just cries, and I love that about him.” She attributes it to his Irish heritage. They are also planning a study trip for ULV students with destinations in the historic south. Included will be the Raymond Pettis Bridge, First AME Church and places in Alabama, Tennessee and Mississippi. In June, Dan and Sharon plan to map and test out their route. Sharon says it would work well in conjunction with Dan’s class about the 1960s. Dan marched with more than 800,000 people across the world on March 22, 2018, for March for Our Lives, organized by the Parkland students. 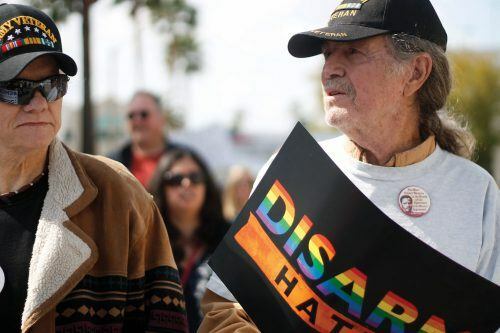 He says this type of grassroots movement is reminiscent of his anti war rallies and marches he helped to organize, including a Citrus College group who would write 1,000 letters a day to congressmen and politicians. Once a month, they would hold a “blitz” where they would send 10,000 in one day. 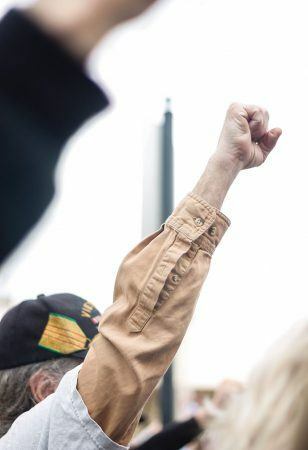 When he returned from Vietnam, he helped form a chapter of Vietnam Veterans against war, which started with just six people. By their fourth meeting they had 600 attendees. Six months later, they over filled the Citrus Stadium with more than 1,000 people. “It was a crazy time, but it was alive, there was energy that was just absolutely phenomenal,” Dan says. He recounts a time when he set up a PA system in the middle of Citrus and started blasting, “End the war; come to our meeting.” It took about 45 minutes for the administration to come out and make them stop, but what was planned to be a meeting of about 100 people, turned out to be 500. “They were like, ‘I’ve been waiting on somebody to do something,’ Well, you’re somebody. You do something,” he says. Dan led the way in creating a veteran’s center for ULV’s nearly 800 veterans. “In organizing, you have to be kind of bold some times. So I marched into the president’s office and said, ‘Hey, we got tons and tons of veterans here, and they don’t have anything. 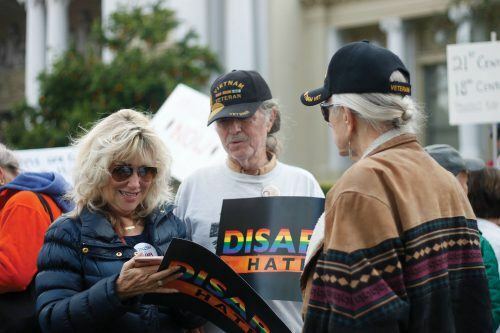 What are we going to do about it?’” Working with Veterans Services Coordinator Diana Towles, they sent out a survey to find out what veterans were looking for in a center on campus. Dan says they overwhelmingly responded wanting a place to “sit and talk with other vets.” The center will open in fall 2018.
he government continued to use Agent Orange for two years after discovery of its harsh and deadly effects. Agent Orange was used while Dan served in Vietnam. “It’s really personal to me, because I have lost 18 people to Agent Orange cancer,” Dan says slowly. “I have had 200 skin cancers, and I’ve had cancer four times. People are dying left and right. It is the worst stuff ever put on earth.” Although they were offered settlements to drop the suit, he says it is not about the money. He wants the government to take responsibility. “They are mass murderers,” Dan says. Dan will literally put his life on the line for what he believes in, Sharon Davis, his life companion says. She recalls a story of him laying down on the train tracks in front of a train transporting soldiers. The train stopped. “The reality is, historians all agree, the anti-war movement is part of the reason the war stopped,” Dan says. “They disagree on the percentage, but I can definitely live with the fact that I helped stop young, poor American kids from getting killed.” While Dan is the type of activist to take physical action, Sharon prefers to use her words and education to invoke change. There are many key roles someone can play to participate in activism, Dan says, as he recalls a friend who would play music during rallies. “I’m not asking everyone to be as whacked out as I am, but I mean there are a lot of levels of involvement,” Dan says. Through his years of protesting, actively working with veterans and fighting for what he believes in, Dan has plenty of stories and advice for the next activist generation. He says it is important to remember that change comes slowly. At times, he became discouraged, but change takes time and consistent effort. Dan steadily refers to the notable effort of the survivors of Feburary’s Stoneman Douglas High School shooting, who are actively fighting for gun reform, protesting and bringing awareness to the issue through social media. More than 800,000 people attended the March for Our Lives rally in Washington D.C., organized by the high school students. Dan went to a sister march in Riverside that spring 2018 day, and says he is ‘hyped up’ by the work the students are doing. “People think if you do a rally, you just say, ‘Hey let’s go to a park and have a rally,’” Dan says sarcastically. “Uh, no, you have to get permits, set up a PA system, give everyone assigned jobs, have a backup for those jobs in case someone gets sick or arrested; it is a complicated process.” He has laid out this process in a 23-bullet point list of items that are essential to remember, from making escape routes, and a rainy day plan to having bail money and business cards handy.